Just the thing to keep your hands warm when you turn the thermostat down to reduce the heating bill. 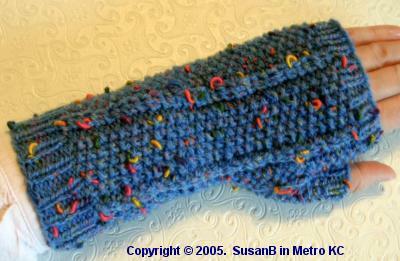 The handwarmers are made in sport weight yarn. About 2 ounces of 3-ply sport weight yarn. The pictured handwarmer is made in TLC Wiggles. Double-pointed knitting needles, sizes 4 and 6. With the larger needles, working in seed stitch, 5 stitches = 1 inch. Method 1: put one stitch on a cable needle and hold in back of work. Knit 1 stitch from left needle, knit 1 stitch from cable needle. Pick up the running thread (the horizontal thread between the stitches on the left and right needle) and place it on the left needle. Knit the new stitch. With smaller needles, cast on [38-42] stitches. Place 14 stitches on first needle, [12-14] stitches on the second needle and [12-14] stitches on the third needle. Work in k1, p1 ribbing for 1 inch. Row 1: Switch to larger needles. *k1, p1. Repeat from * to end of round. Row 2: twr, (p1, k1) 3 times, p2, twr, (p1, k1) [3-4] times, p1, twr, (p1, k1) 3 times, p2, twr, (p1, k1) [3-4] times, p1. Row 3: k2, p2, (k1, p1) 3 times, k2, p2, (k1, p1) [1-2] times, k1, p2, k2, p2, (k1, p1) 3 times, k2, p2, (k1, p1) [1-2] times, k1, p2. Repeat rows 2 and 3 until handwarmer is about 4 inches long, ending with row 3. Row 2: k2, p2, (k1, p1), k2, p1, k1, p1, k2, p2, (k1, p1) [1-2] times, k1, p2, k2, p2, (k1, p1) 3 times, k2, p2, (k1, p1) [1-2] times, k1, p2. Row 4: k2, p2, (k1, p1), k4, p1, k1, p1, k2, p2, (k1, p1) [1-2] times, k1, p2, k2, p2, (k1, p1) 3 times, k2, p2, (k1, p1) [1-2] times, k1, p2. Row 6: k2, p2, (k1, p1), k1, p1, k1, p1, k2, p1, k1, p1, k2, p2, (k1, p1) [1-2] times, k1, p2, k2, p2, (k1, p1) 3 times, k2, p2, (k1, p1) [1-2] times, k1, p2. Row 8: k2, p2, (k1, p1), k2, p1, k1, p1, k3, p1, k1, p1, k2, p2, (k1, p1) [1-2] times, k1, p2, k2, p2, (k1, p1) 3 times, k2, p2, (k1, p1) [1-2] times, k1, p2. Row 10: k2, p2, (k1, p1), (k1, p1) 4 times, k2, p1, k1, p1, k2, p2, (k1, p1) [1-2] times, k1, p2, k2, p2, (k1, p1) 3 times, k2, p2, (k1, p1) [1-2] times, k1, p2. Row 12: k2, p2, (k1, p1), k2, (p1, k1) 3 times, p1, k3, p1, k1, p1, k2, p2, (k1, p1) [1-2] times, k1, p2, k2, p2, (k1, p1) 3 times, k2, p2, (k1, p1) [1-2] times, k1, p2. Row 14: k2, p2, (k1, p1) 7 times, k2, p1, k1, p1, k2, p2, (k1, p1) [1-2] times, k1, p2, k2, p2, (k1, p1) 3 times, k2, p2, (k1, p1) [1-2] times, k1, p2. Row 16: k2, p2, k1, (p1, k1) 7 times, [k1-k2], p1, k1, p1, k2, p2, (k1, p1) [1-2] times, k1, p2, k2, p2, (k1, p1) 3 times, k2, p2, (k1, p1) [1-2] times, k1, p2. Row 17: twr, (p1, k1) twice. k1, (k1, p1) 5 times, k1, [p0-p1], k1, p1, k1, p2, twr, (p1, k1) [3-4] times, p1, twr, (p1, k1) 3 times, p2, twr, (p1, k1) [3-4] times, p1. Row 18: Repeat row 16. Row 20: k2, p2, (k1, p1) 4 times, k2, p2, (k1, p1) [1-2] times, k1, p2, k2, p2, (k1, p1) 3 times, k2, p2, (k1, p1) [1-2] times, k1, p2. Row 21: twr, (p1, k1) 4 times, p2, twr, (p1, k1) [3-4] times, p1, twr, (p1, k1) 3 times, p2, twr, (p1, k1) [3-4] times, p1. Repeat rows 20 and 21 until upper hand section measures about 1 inch long, ending with row 21. Switch to smaller needles. Work 4 rows of k1, p1 ribbing. Cast off in rib pattern. Row 1: (p1, k1) [8-9] times. Row 2: (k1, p1) [8-9] times. Row 3: (p1, k1) [8-9] times. Rows 4, 5, &6: (k1, p1) [8-9] times. Cast off in rib pattern. Weave all yarn ends in securely. Copyright ©2006. SusanBLuvsCrafts (a.k.a, SusanB in metro KC) All Rights Reserved. A single copy of this pattern may printed and shared with a friend providing the entire web page is printed, including copyright information and this notice, and the printout includes the web address (URL) of this page. Do not share all or any part of this page that has been copied and pasted into a word or text processing program. The patterns on this web site are for non-commercial use only. If you wish to use a pattern for any commercial (i.e., for profit) purpose or want to share several copies of pattern, please contact the designer via the Contact page. Page design by SusanBLuvsCrafts. Last modified: July 31, 2013.